I know what you’re thinking. Sure, Baby Shark is an icon for the modern age, but is it possible to hear more about him and his predatory family members? Well, those who long to analyse those poignant lyrics about the brutality of ocean life in greater depth are in for a real treat. The whole bloodthirsty gang have swam out of the ocean and are thrashing their way into children’s Santa sacks, under the guise of soft, huggable toys. Crucially, they can belt out the tune which brought them such delirious levels of fame. Over and over and over again… doo doo, doo doo doo, doo doo. Parents can now stare into the cold, vacant eyes of Baby Shark, Mommy Shark and Daddy Shark, and – with a simple tummy squeeze – listen to them croon about their insatiable desire to hunt and kill. Just in time for Christmas! Interestingly, seasoned killers Grandma Shark and Grandpa Shark – key protagonists in the original ballad – do not appear to have been given a plush incarnation this year. Sadly, I suspect this is less to do with age discrimination and more to do with the harsh fish-eat-fish life beneath the waves which is no doubt incompatible with a long and comfortable old age. 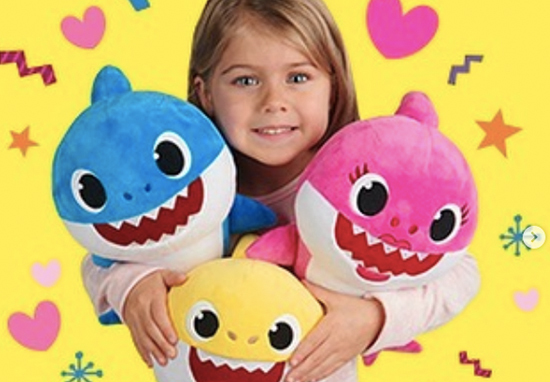 Of course, young fans of the Baby Shark universe will dream of owning the full collection. I mean, just imagine the thrill of finally allowing Baby Shark, Mommy Shark and Daddy Shark sing in chorus; giving daily concerts before enthralled family members. Produced by WowWee for Baby Shark masterminds’ Pingfong, the cuddly toys are available to pre-order from Amazon, and will officially go on sale from December 15 onwards. The eternally grinning teddies are priced between $49.99 and $69.99 (around £39 and £55), which I guess isn’t too bad when you consider how much you pay for non-living room based gigs nowadays. Unfortunately, Amazon is not yet shipping the Baby Shark teddy over to the UK just yet, potentially because the toothy wunderkind can’t yet swim quite as fast as his weather-worn parents. However, Brits can still get their pectoral fins on Daddy Shark and Mommy Shark who are undoubtedly still big names within the Shark dynasty. If you prefer to stack sharks like building blocks, you can also purchase Baby Shark Cubes for a slightly cheaper $39.99 (£31.53) a pop. Don’t worry, these guys can still warble the night away despite having been cubed like scrapped cars. The reviews for these squeezable toys have been fairly positive, with many parents praising the toys as ‘adorable’ and ‘super cute’. I expected to burn it in effigy. But we’re keeping it. Although this song may drive me crazy sometimes its very cute and my two-year-old loves it… These will put a smile on her face.